Insert custom text on your desktop pictures. Is there a better alternative to My Wallpaper? Is My Wallpaper really the best app in Desktop category? Will My Wallpaper work good on macOS 10.13.4? My Wallpaper…You love wallpapers but they always miss a personal touch? 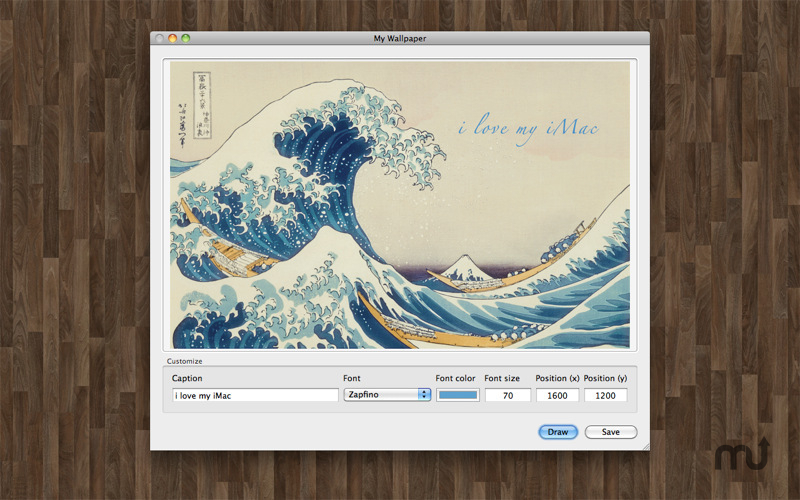 "My Wallpaper" allows you to modify your wallpaper and insert any text. Think of the name of your girlfriend, your cat or simply a quote by someone you like. Simply drag and drop your wallpaper to the icon and then modify it. The generated images can be saved as PNG-Image and set as wallpaper in the system settings. My Wallpaper needs a rating. Be the first to rate this app and get the discussion started!